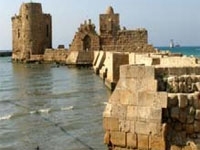 Discover the South of Lebanon capital, Sidon, mentioned in the famous "Al-Amarna" letters. You will visit the castle, the caravansary, the medieval souks, the soap museum and Eschmoun temple. Then continue to Tyre. After lunch, visit the archeological sites of the ancient city regarded as a part of the international patrimony. The third great Phoenician city-state, Sidon's origins are lost from memory. The name was mentioned in the texts for the first time in the 14th century B.C. in the 'Tell El Amara Letters'. But it was during the Persian era, between the end of the 6th century B.C. and the mid-4th century B.C. that the city experienced its golden age.Sidon was an open city with many cultural influences, including the Egyptian and the Greek. During the Persian period, Aegean sculptors contributed to the nearby temple of Eshmoun, the city's god. He was associated with the Aesculapius, the Greek god of healing. After its revolt against the Persians and destructions in 351 B.C., Sidon never regained its former glory. But the city's position had improved by 551 A.D., when after the disastrous earthquake of that year it was chosen as the site of Beirut law school. The crusader period, between 1110 and 1291, brought Sidon new prestige as the second of the four baronies of the Kingdom of Jerusalem. Today the ruins of the Crusader sea Castle and the Castle of Saint-Louis, Known as the land castle, can still be seen in Sidon. From the Mamluke and Ottoman periods we have the Great Mosque, built on the foundations of a Crusader building and the Khan 'el – Franj" built by Fakhreddine II.Today the town 41 Kilometers from Beirut, has grown into a thriving commercial and business centre serving the entire region. Although the earliest origins of Tyre are unknown, the testimonies of ancient historians and some archeological evidence suggest that it goes back to the start of the 3rd millennium B.C. Originally a mainland settlement with an island city a short distance offshore, it came of age in the 10th century B.C. when King Hiram expanded the mainland and built two ports and a temple to Melkart, the cityIts flourishing maritime trade,'s god.Its flourishing maritime trade, Mediterranean colonies and its purple dye and its purple dyeand glass industries made Tyre very powerful and wealthy. But the city's wealth attracted enemies. In the sixth century B.C. the Tyrians successfully defied Nebuchadnezzar for 13 years. Alexander the Great laid siege to it for 7 months, finally overwhelming the island city by constructing a great causeway from the shore to the island. In their day the Romans built a magnificent city at Tyre. The remains of its Roman streets, arcades and public buildings, including one of the largest hippodromes of the period, are Tyre's major attractions today. Occupied by the Moslem Arabs in 636, then captured in 1124 by the Crusaders, Tyre was an important fortified town of the Kingdom of Jerusalem. In 1291 the Mamlukes took the city, then during the 400-year Ottoman period beginning in 1516, it remained a quiet fishing town. In 1984 Tyre's important archeological remains prompted UNESCO to make the town a world heritage site. Located 79 km from Beirut, prosperous Tyre is notable for its many high-rise buildings. Nevertheless, the inner city has retained its industrious maritime character and its interesting old-style houses.